In a new study published in the journal Molecular Cell, scientists have discovered a new way to stop lung cancer cell growth by blocking the cells’ ability to use alternative nutrition sources. The scientists identified the metabolism that cancer cells use to increase their growth. As a result of the study, new avenues of lung cancer treatment are being explored. Cancer cell metabolism is distinctly different than normal cells. The rapid spread of cancer cells means they have greater energy needs. The cancer cells get their increased energy needs with sugar (glucose) as the main nutrition source. Cancer cells will use sugar at rates tens or even hundreds of times larger than that of normal cells. On the other hand, when there is a lack of sugar, cancer cells need to use alternative energy sources to continue to grow and stay alive. The study included a research team from McGill University in Canada, ITMO University in Saint Petersburg, Russia, Washington University in St. Louis, and the University of Bristol in the U.K. For the study, researchers examined the non-small cell lung cancer response when there is a reduced availability of sugar as the main energy source. Researchers found that some of the lung cancer cells will switch to the amino acid glutamine from glucose when there is not enough sugar. The research team also found that cancer cells use the enzyme called phosphoenolpyruvate carboxykinase (PEPCK) to reset the metabolism of cancer cells. Previous studies had only studied PEPCK in glucose-producing tissues like the liver. The researchers found that they could slow tumor growth in mice by blocking PEPCK in cancer cells. “We found that some cancer cells also express PEPCK, and this confers to them the ability to convert glutamine into energy and building blocks to support their growth. By making this metabolic switch, PEPCK allows cancer cells not just to survive, but to continue to proliferate under starvation conditions,” explained lead study author and research associate at McGill University Emma Vincent. The researchers also discovered that lung cancer patients had an increase of PEPCK levels in their tissues. Overall, the study suggests that cancer progression can be impacted by the availability of nutrients in the area where cancer cells compete for their nutrition. All lung cancers are divided into two types—small cell lung cancer and non-small cell lung cancer. Non-small cell lung cancer is more common and amounts for 85% to 95% of lung cancer patients. 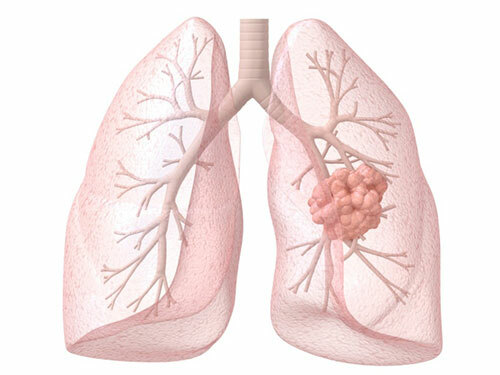 Primary lung cancer occurs when a malignant tumor starts in the lung cells. It is considered one of the most dangerous types of cancers. According to the American Cancer Society, lung and bronchial cancers are the top cancer-related deaths. There will be 158,040 lung and bronchial cancer-related deaths expected for 2015. Vincent, E.E., et al., “Mitochondrial Phosphoenolphyruvate Carboxykinase Regulates Metabolic Adaptation and Enables Glucose-Independent Tumor Growth,” Molecular Cell 2015; 60(2): 195–207, doi: 10.1016/j.molcel.2015.08.013. “Scientists find new way to inhibit growth of lung cancer cells,” News Medical Sciences & Medicine web site, October 21, 2015; http://www.news-medical.net/news/20151021/Scientists-find-new-way-to-inhibit-growth-of-lung-cancer-cells.aspx. “Cancer Facts & Figures 2015,” American Cancer Society web site; http://www.cancer.org/acs/groups/content/@editorial/documents/document/acspc-044552.pdf, last accessed October 21, 2015. “What is lung cancer?” Canadian Cancer Society web site; http://www.cancer.ca/en/cancer-information/cancer-type/lung/lung-cancer/?region=on, last accessed October 21, 2015.